THEY MIGHT STILL be a long way off the glory years of the late ’90s and early ’00s, but there is a real sense of optimism at Shelbourne currently that has not always been palpable in recent times. The Tolka Park outfit came close to promotion from the First Division last year, but ultimately missed out, after being defeated on penalties by Drogheda. As a result, they parted ways with Owen Heary — their manager and legendary ex-player who captained the side to a number of league titles, among other notable feats, during their ’00s heyday. In his place came Ian Morris — a 31-year-old who had been playing with Bohemians up to that point, as well as serving as their Head of Youth Development. 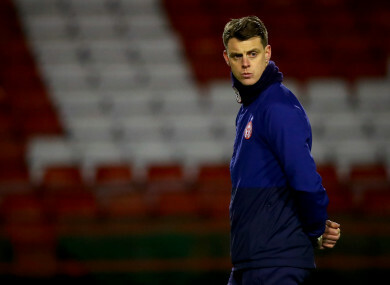 “Ian has had a distinguished and highly successful career in England and since he has returned to Ireland, he has proven himself to be a fantastic coach, particularly with young players,” Shelbourne CEO David O’Connor said at the time. “Ian possesses all of the attributes we were looking for in a Head Coach. His knowledge of the game is excellent and his work ethic, self-belief and leadership skills will be evident to everyone. The sense of it being a new era at the club was further highlighted by the arrival of several new players in the off-season, many of whom are experienced League of Ireland campaigners. Conan Byrne and Ryan Brennan have arrived from St Pat’s, in addition to Bohs trio Colin McCabe, Dan Byrne and Oscar Brennan. Ex-Dundalk forward Ciaran Kilduff is back from his Stateside spell with Jacksonville Armada, while former Liverpool youngster Alex O’Hanlon has joined after a brief stint at Glentoran. And given the calibre of player they have recruited, it is no surprise to see Shels as most bookies’ strong favourites to top the First Division this season. Morris, however, insists he is unaffected by this pre-season hype. The Dubliner adds that he is content with the business he has done pre-season, and says the sense of expectation these eye-catching deals have created will not have a substantial impact on himself or the team. Pressure’s going to come no matter what you do,” he says. Leaving Bohs after three years there was “very difficult,” though he was excited by Shels’ plans once he had the opportunity to discuss them. Morris, however, is under no illusions as to the scope of the challenge that lies ahead in getting the club promoted and attempting to help the Dublin side reclaim their place as one of the top teams in the country. “Every day something pops up, whether it’s something to do with a player or training, or something off the field. The budget was massive, getting that done, getting players signed, that was interesting, sitting on the other side of a desk to negotiate a contract. As taxing as it may be at times, for Morris, his new role represents the fulfillment of a long-term ambition. “Since I was very young, I’d always have notepads from training sessions from all the clubs I’ve been at. Morris certainly has plenty of experience from his time in the game to lean on. As a youngster, he joined Leeds around the same time they were reaching the Champions League semi-final and wowing football fans with their exciting style and youthful exuberance. He cites two of the coaches he worked under at the Yorkshire-based club, Eddie Gray and Brian Kidd, as key influences. In the 2005-06 campaign, the Irish player got his first taste of first-team football on loan at Blackpool, before leaving Leeds permanently the following season to link up with Scunthorpe. The young midfielder spent nearly five years with the Iron, making over 90 appearances and scoring eight goals. He spent time on loan at Carlisle and Chesterfield, helping the latter win the League Two title, before leaving Scunthorpe for good and spending two years apiece at Torquay and Northampton Town. In 2015, he returned to Ireland and had short stints with St Patrick’s Athletic and Glenavon, before linking up with Bohs. Having racked up over 200 appearances in English football, Morris feels its standard below the Premier League is underappreciated on this side of the water. You look at the people that everyone is lording as the best players in Ireland and it’s really difficult [for them] to kick on in England. I think League One and League Two are nearly looked down upon over in Ireland. Both are exceptionally tough leagues and the Championship is an even higher step. And having enjoyed success as a player, Morris is now hoping he can do likewise on the sidelines, as his burgeoning career in senior management gets underway. His first competitive game as a manager takes place tomorrow night, when his side travel to face Galway United. Email “The 31-year-old coach tasked with bringing back the glory days to Shelbourne”. Feedback on “The 31-year-old coach tasked with bringing back the glory days to Shelbourne”.